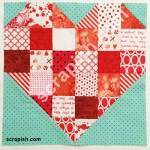 The single Irish Chain quilt block makes for an easy quilt pattern. 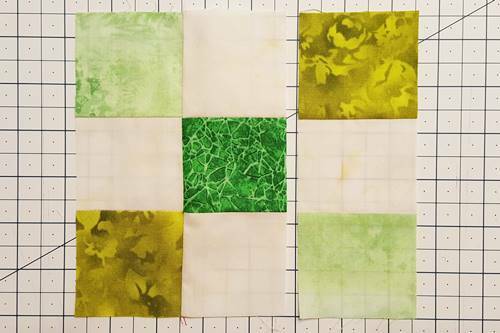 Use strip sets to make the blocks for even faster quilting! For a dramatic look use a colored fabric for the chain patches and a lighter, more solid fabric for the background patches. 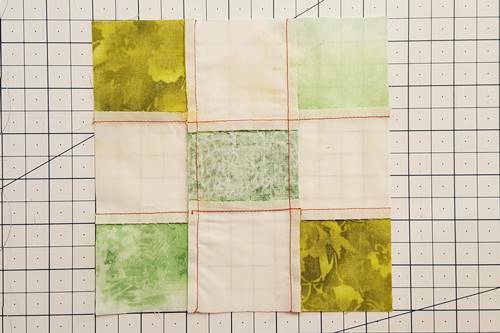 Use a colored fabric for the first patch (top left corner), follow it with a lighter background fabric and then a colored fabric. Alternate the sequence in Row 2. Then, repeat the sequence of Row 1 for Row 3. In the picture above you can see the 'chains' begin to form even within a single block. One 'chain' - made of medium and dark green fabrics - leans toward the right. The other 'chain' - made of light and dark green fabrics - leans toward the left. This sequence becomes even more apparent in the single Irish chain quilt pattern (link at end of this tutorial). 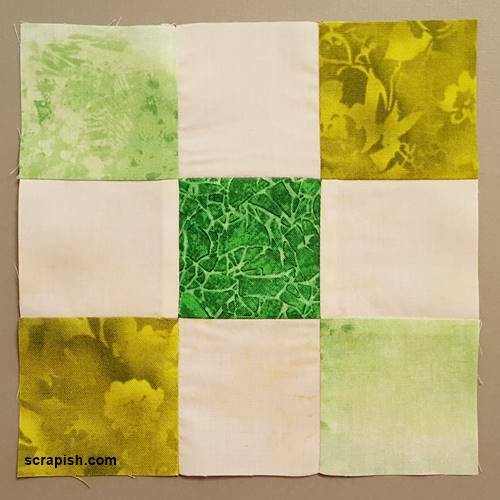 You can easily make this block scrappy by using different shades of a single color or entirely different colors of fabric for the 'chain' patches. Use yardage or precut strips. 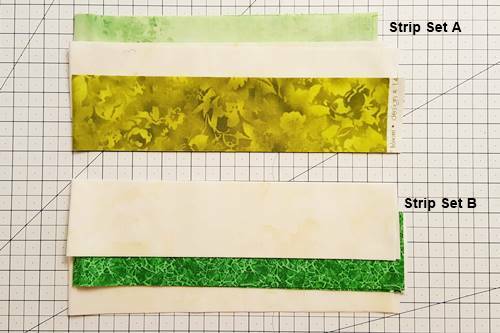 You can use jelly rolls (2 1/2 inch wide by WOF strips) or any width size strip you choose. 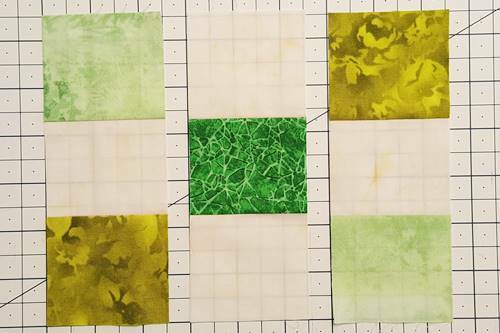 For this tutorial, I will use yardage and cut 2 1/2 inch strips to make a 6 1/2 inch unfinished block (6 inch finished). 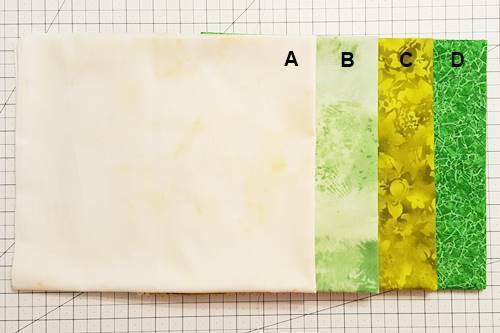 The color of the fabrics are three shades of green and a mottled cream-colored fabric. 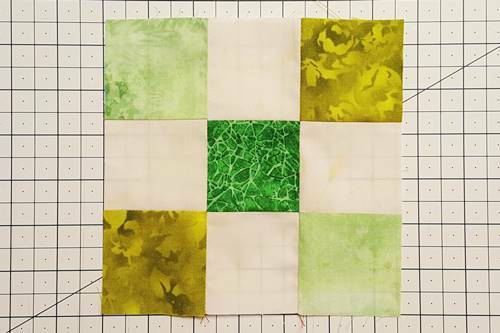 In this tutorial, I will show you how to use strip sets to make the block more quickly. Step 1b Group Strips. You will make two strip sets designated as Strip Set A and Strip Set B. 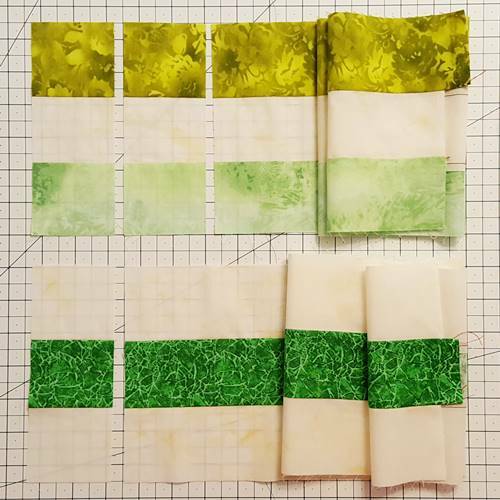 Strip Set A: One each of Fabrics B (light green), A (cream) and C (medium green). 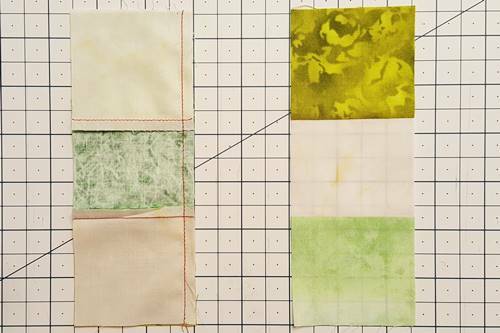 Strip Set B: Two of Fabric A (cream) and one D (dark green). Step 2a Make Strip Set A. 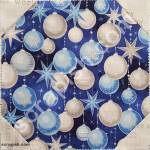 With right sides together and using a 1/4 inch seam, stitch one Fabric C to Fabric A along their long right hand sides. With right sides together and using a quarter inch seam, stitch one Fabric B to Fabric A along their long right hand sides. 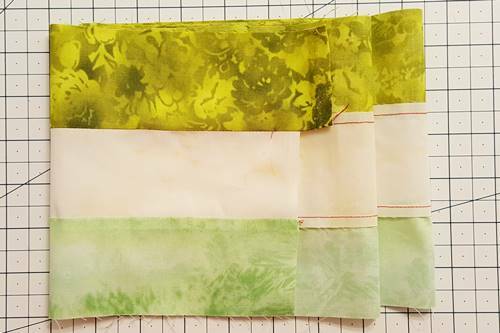 Press the seams outward, towards the darker Fabrics B and C.
Note: Review this tutorial for a refresher or to learn how to make strip sets. Step 2b Make Strip Set B. 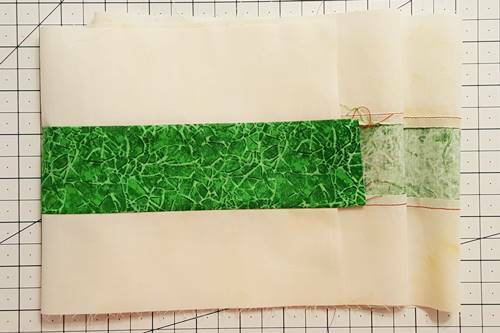 With right sides together and using a 1/4 inch seam, stitch one Fabric A to each long side of Fabric D.Press the seams outward, towards the darker Fabric D.
Step 3a Subcut Block Units. Get a straight edge on the strip set on the end where the selvages are aligned. 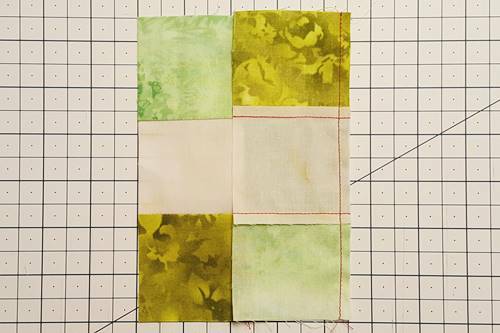 Place a horizontal measurement line of a quilting ruler along one of the horizontal seam lines. With a rotary cutter, cut off the selvage edge of the strip set, making a straight edge. Turn the strip set as necessary for a better angle to make your cuts. 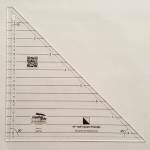 Align a horizontal measurement line of the quilting ruler along the lower horizontal seam while aligning the vertical measurement line along the straight edge of the strip set for the width that you need. 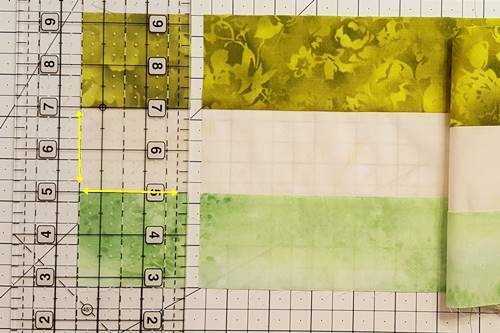 To make a 6 inch finished size Irish chain quilt block, align the ruler along the 2 1/2 inch vertical measurement line. Cut the strip set along the right edge of the quilting ruler. You've subcut a 2 1/2 inch unit. Step 3b Make All Subcuts. Continue to subcut both strip sets at 2 1/2 inch increments along their entire length. Step 4a Make the Irish Chain Quilt Block. Each block will use two units from Strip Set A and one unit from Strip Set B. Decide in which direction you want the lighter and darker chains to flow. Step 4b With right sides together, place the second unit on top of the first. Align raw edges and nest seams. Stitch them together with a 1/4 inch seam along the right side. Step 4c Open the units so that their right sides face up. Step 4d With right sides together, place the third unit on top of the second. Align raw edges and nest seams. Stitch them together with a 1/4 inch seam along the right side. Step 4e Open the units so that their right sides face up. The Irish chain quilt block is complete! Step 5 Press the seams outwards, away from the center unit. 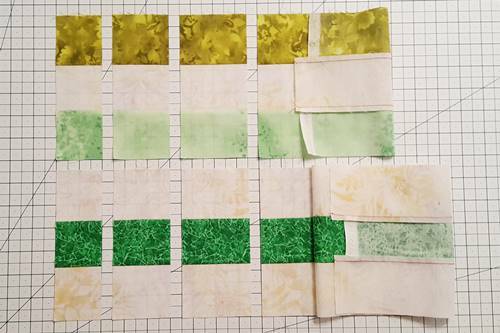 For a more modern look in the single Irish chain quilt block try this – cut the units of your strip sets in different widths. For example, I cut my units into 2, 2 1/2 and 3 inch units for both strip sets. As you can see there is a subtle difference in all three blocks. The different sized units give the blocks a look that's a little offkilter. 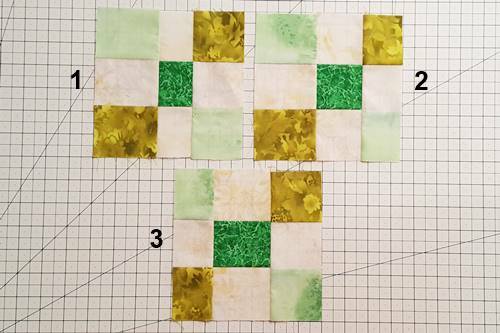 When the modern Irish Chain quilt blocks are assembled into a quilt it looks more handmade, even though all the blocks are the same size. I think it this little trick gives the pattern a somewhat modern feel. I like it! See for yourself. Once you have made your Irish chain quilt blocks, traditional or modern, go ahead and make a quilt using this very easy Irish chain quilt pattern.